Harrogate Railway manager Marlon Adams believes that his players must get fitter if they are to start climbing the NCEL Premier Division table. Speaking in the wake of Saturday’s 3-0 home defeat to Staveley Miners Welfare, the Station View chief highlighted a number of areas where his side can improve, but pinpointed their general fitness as being key to any hopes of escaping the relegation zone. “There area lot of things to work on, but the main priority is the fitness. It’s one of the basics of football, if you’re not fit then you’re not going to win games,” Adams reflected. “You could see against Staveley, they ran for 90 minutes and created chances for 90 minutes, we defended for 90 minutes and couldn’t get out of our own half at times. “It was like a game of attack versus defence at times, but how long can a team defend for before the opposition go one or two goals up? 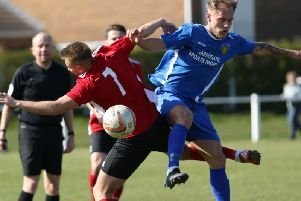 Staveley went into Saturday’s clash just two positions above 20th-placed Railway in the league table and on the back of a seven-match losing run, but alarmingly for Adams, the Trojans won the game with ease. There was little to choose between the sides during the opening quarter of an hour, but the visitors always looked like they carried more of a threat going forwards and they slowly began to move through the gears. Tom Ellis got down the left wing all too easily in just the fourth minute and crossed to the back post where Charlie Oglesby headed wide of the mark. At the other end, during what was probably the Rail’s brightest spell of the game, former Southport and Brighouse Town prospect Ruben Jerome curled a left-footer over the bar from the edge of the box before George Eustance cut in from the right but scuffed a tame effort well wide. Railway then lost midfielder Michael Thompson, who had begun the game brightly, to injury and were forced to bring Brad Swain, usually a centre-half, off the bench and into the middle of midfield. Thompson’s absence was felt, and as the hosts struggled to generate any real forward momentum, Staveley began to look more and more threatening. A dipping free-kick from the right wing was tipped onto his crossbar and over by Rail gloveman James Webster. A flurry of corners followed, and Josh Barker saw a back-post header blocked on the goal-line. A mix-up between Webster and his defence then saw Ally Wilson forced to hack the ball away as it bounced towards an unguarded goal, but from the resulting 43rd-minute corner, the away team took the lead. The ball was half-cleared to the edge of the box where Adam Baskerville met it with a sweet strike that flew into the corner of the net. It was a case of much of the same after the break as Railway were unable to make any impression in the final third, while by contrast, Staveley played some decent football on a heavy, wet surface that deteriorated as the match progressed. Adams made a further two changes as he tried to freshen up his side, but the introduction of Adam Carter and Matt Mulvihill did little to alter the pattern of the game. Staveley had worked a couple of openings without managing to test Webster, but in the 71st minute a tidy move up the pitch saw the ball laid off to Baskerville just outside the area, and he stroked a precise effort into the bottom right of the goal. Worse was to come as Lincoln Adams dallied on the ball inside his own box instead of clearing the danger, leading to a penalty being awarded as an attacking player was sent sprawling. Baskerville stepped up and calmly sent Webster the wrong way from 12 yards to complete his hat-trick and wrap up a comprehensive success for the Trojans. “It was very disappointing from start to finish, but to be fair Staveley came and played some decent football,” Adams added. “Unluckily for us, one of our better midfielders [Thompson] went off injured, so it was hard for us to get on the ball in midfield and create any chances. “So what we did was play a lot of long balls which they were winning and they picked up every single second ball. “This is the frailty of the squad at the moment though. We have a lot of attacking options and plenty of defensive cover, but we’ve got nothing in the centre of the park in terms of cover.